Coconut oil is a fairly new “trendy” super food. 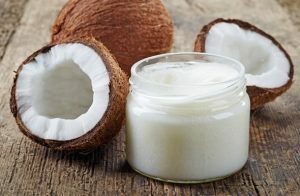 The impressive health benefits back up the growing trend, research has show coconut oil benefits multiple areas of overall health, including skin care, hair care, weight loss, brain function, bacterial infection treatment, improving digestion and increased immunity against a host of infections and diseases. The oil is used not just in tropical countries anymore, where coconut plantations are abundant. People have discovered the holistic remedies and metabolic health benefits that this oil can create and it is gaining major popularity throughout the world especially in the United State of America. Heart diseases: There is a misconception spread among many people that coconut oil is not good for heart health. This is because it contains a large quantity of saturated fats. In reality, it is extremely beneficial for the heart. It contains about 50% lauric acid, which helps in actively preventing various heart problems like high cholesterol levels and high blood pressure. Coconut oil does not lead to an increase in LDL levels (bad cholesterol). It has been shown to keep arteries healthy and free of damage thus reducing the risk for hardening of the arteries, also known as atherosclerosis. Weight loss: Coconut oil is very useful for weight loss, we now know that all fat is not created equal and healthy fats do not contribute to weight gain. Coconut oil contains short and medium-chain fatty acids that are directly related to reducing abdominal obesity in women. It is also easy to digest and it helps in the healthy functioning of the thyroid and endocrine system. Further, it increases the body’s metabolic rate and pancreatic function, the pancreas is directly related to metabolizing insulin, which is the major contributor to weight management. If insulin levels are properly controlled through nutrition and lifestyle, then the body will be able maintain optimal weight more easily due to reduced carbohydrate and sugar cravings. Immunity: Coconut oil strengthens the immune system because it contains antimicrobial lipids, lauric acid, capric acid and caprylic acid, which have antifungal, antibacterial and antiviral properties. The human body converts lauric acid into monolaurin, which research has supported as an effective way to deal with viruses and bacteria that cause diseases like herpes, influenza, cytomegalovirus, and even HIV. Coconut oil helps in fighting harmful bacteria like listeria monocytogenes and helicobacter pylori, and harmful protozoa such as giardia lamblia. Digestion: Internal functions of coconut oil occur primarily due to it being used as cooking oil. It helps to improve the digestive system and thus prevents various stomach and digestion-related problems including irritable bowel syndrome. The saturated fats present in coconut oil have antimicrobial properties and help in dealing with various bacteria, fungi, and parasites that can cause indigestion. It also helps in the absorption of other nutrients such as vitamins, minerals and amino acids. Dental care: Calcium is an important component of our teeth. Since coconut oil facilitates absorption of calcium by the body, it helps in developing strong teeth, and reduces the chance of tooth decay. Candida: Candida, also known as Systemic Candidiasis, is a tragic disease caused from excessive and uncontrolled growth of yeast called Candida Albicans in the stomach. Coconut provides relief from the inflammation caused by Candida, both externally and internally. Its high moisture retaining capacity keeps the skin from cracking or peeling off. Capric acid, Caprylic acid, caproic acid, myristic acid and lauric acid found in coconut oil help in eliminating Candida albicans. Further, unlike other pharmaceutical treatments for candida, the effect of coconut oil is gradual and not drastic or sudden. In the treatment of these conditions, people should systematically and gradually increase their dosages of coconut oil and shouldn’t initially start with a large quantity. Healing and Infections: When applied to infected areas, coconut oil forms a chemical layer that protects the infected body part from external dust, air, fungi, bacteria and viruses. Coconut oil is highly effective on bruises because it speeds up the healing process of damaged tissues. Keeping Organs Healthy: The presence of medium chain triglycerides and fatty acids in coconut oil helps in reducing the chance for liver disease, specifically fatty liver disease, which is related to Type 2 Diabetes and/or alcohol abuse. Dementia/ Alzheimer’s Disease: There are several pieces of research that show major benefits of consuming coconut oil regularly for those with dementia and Alzheimer’s disease. The brain is primarily comprised of fat and it is nourished properly with high healthy fat consumption. All natural healthy fats like coconut oil, avocado, nuts; seeds and other oils are the best way to optimize brain health and function. Diabetes: Coconut oil helps in controlling blood sugar, and improves the secretion of insulin. It also promotes the effective utilization of blood glucose, thereby preventing and treating diabetes. Bones: As mentioned earlier, coconut oil improves the ability of our body to absorb important minerals. These include calcium and magnesium, which are necessary for the development of bones. Thus, it is very useful to women who are prone to osteoporosis after middle age. Boosts Energy: Coconut oil is often used by athletes, body builders and by those who are dieting. The reason behind this being that it contains less calories than other oils, its fat content is easily converted into energy, and it does not lead to accumulation of fat in the heart and arteries. Coconut oil helps boost energy and endurance, and generally enhances the performance of athletes. Skin care: Coconut oil is an excellent massage oil that acts as an effective moisturizer on all types of skin, including extremely dry skin. It is a safe solution for preventing dryness and flaking of skin. Due to its well-known antioxidant properties, it also helps in treating various skin problems, including psoriasis, dermatitis, and eczema. Coconut oil has become a common ingredient in high quality cosmetics. Hair care: Coconut oil helps in healthy growth of hair and gives your hair a shiny quality. It is also highly effective in reducing protein loss, which can lead to various unattractive or unhealthy qualities in your hair. It is used as hair care oil and is used in manufacturing various conditioners and dandruff relief creams. It is normally applied topically for hair care. Beginner’s Guide to using and consuming coconut oil. Extra virgin coconut oil is the best quality. I suggest buying two jars of it, one for consumption and one for external/ topical use. Coconut oil can be added to coffee, there is a common recipe for a dairy free coffee blend called bullet proof coffee, this is a combination of clarified butter, coconut oil and coffee blended for a super food start to your morning. It can be used as a cooking and/or baking oil to stir fry vegetables, pan sear chicken, etc. or as a dairy free ingredient to bake with. There are several gluten free and dairy free Paleo recipes that call for coconut oil as the main source of fat. Make your own lotion by double boiling coconut oil, shea butter and your favorite essential oil. This concoction is great for preventing stretch marks in those who are expecting and reducing appearance in those who are trying to get rid of their stretch marks. Store room temperature in a dry place. Coconut oil is a healthy fat that does not negatively influence heart disease risk, weigh gain, or overall health. Instead it improves overall health specifically brain function, heart health, weight management, skin, hair, digestion and the immune system.